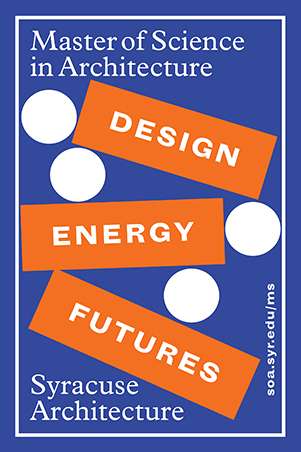 Beginning in fall 2016, students enrolled in the post-graduate master of science in architecture program will participate in a new, three-pronged “Design | Energy | Futures” research and design concentration. The three-semester, 30-credit-hour program will focus on energy and the built environment, with research and design projects ranging across many scales—from urban design to high-performance buildings, from landscape urbanism to building material research and product design, and across a range of disciplinary and practice areas including adaptive re-use, real estate development and urban planning. Students may choose to spend one semester based in the school’s New York City, Florence or London program locations. The program is specially targeted to individuals holding a professional degree in architecture, landscape architecture, urban design or urban planning. Applicants with backgrounds in management, engineering, geography, environmental, graphic or product design may also be considered for admission. Center for Coastal Resilience and Urban Excellence, Stevens Institute of Technology, Hoboken, N.J.
“Students and professionals alike can engage with crucial issues that impact contemporary architectural practice,” says Dean Michael Speaks. Studios and seminars taught by Syracuse Architecture faculty, as well as affiliated faculty—Shere Abbott, Syracuse University Vice President for Sustainability Initiatives and Professor of Sustainability Science and Policy, Jianshun Zhang, professor of mechanical and aerospace engineering in the College of Engineering and Computer Science, and Todd W. Moss, Assistant Professor of Entrepreneurship and Sustainability at the Whitman School of Management—are positioned to provide highly focused expertise paving the way for forward-thinking and sustainable development. An international academic advisory board including leaders in humanities, engineering, design, energy research, climate change, environmental systems and future technologies will provide consultation to the program. To learn more about the program, visit http://soa.syr.edu/ms. This program does not meet the licensure requirements to become an architect in New York and is not considered licensure-qualifying in New York.